My daddy was….a used car salesman. “….With your involvement, do you have any inside stories about or insights into the meaning of the song Bankrobber, which you feel may not have been covered by anyone else who wrote about it? I’m not sure where the ‘bank robber’ part of the song comes from, but I read the lyrics as more of an indictment of going-nowhere work that offers no real satisfaction for the person doing the job – I would love to read any expansion on that.” – Andy. “That was a totally insane day at Lewisham Odeon. 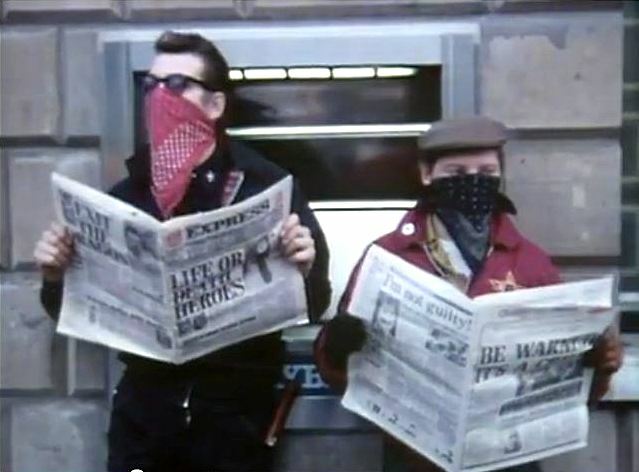 Don Letts turned up with his film crew to take some footage to splice into a video for ‘Bankrobber.’ Having no pre-conceived concept, it was an on-the-spot idea to have me and Johnny Green dress with bandanas’ over our faces and pretend to rob a bank. The Baker and Johnny Green as Bankrobbers. I was less than enthusiastic at the idea, as I already had a full day of work preparing for the show that night. But Don assured us it wouldn’t take long and Johnny coerced me along. 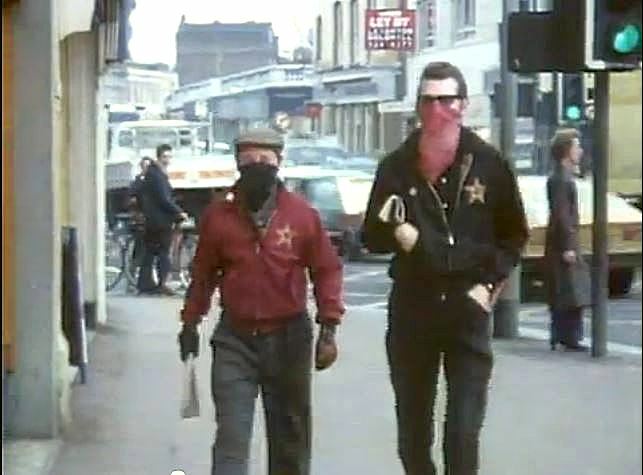 I couldn’t see the point at the time – we were the most unlikely-looking bankrobbers you could ever imagine….Johnny’s gangly stick insect figure looking ten-feet tall made me look even shorter and squat than normal. Later watching the finished video, I finally understood the comedic visual Don was trying to put forth and it actually worked very well. So he filmed us leaning up against the wall, running out of the bank, running down Lewisham High Street alarming shoppers, tearing across roads, jumping over the camera – it went on and on and all I could think about was what I should have been doing the whole time back at the gig. Suddenly two police Rovers came screeching round the corner, grabbed us and bundled us all up against the wall! If only we’d got the money in real life! Joe could just as easily have sung “Freddie Smith” or “My best friend….” But he chose to name his own father as the bankrobber in question, thus linking himself to a lifestyle of non-violent resistance to conformity and working for the system. His many lyrics would often run along this theme as a rejection of dead-end, go-nowhere work that offers little tangible fulfillment or compensation from “Career Opportunities,” “Death or Glory,” “Working for the Clampdown,” to “Magnificent Seven,” they all deal with the same question of submission to a system that offers nothing real and eventually grinds one down to an unthinking robot…. A rare glimpse of Bernard Rhodes. about. From very early on, I felt that Bernie Rhodes took on the role of Joe’s surrogate adopted father-figure and continued throughout their tempestuous relationship. Even before they met, Joe had attached himself to older men like Tymon Dogg and Dave Goodall who had acted as moral and political mentors. Joe’s rejection of authority and home-life was a very evident sign of his lack of emotional stewardship throughout his formative years. Tymon, Dave, and later Bernie, no doubt fulfilled the fatherly role that Joe had been seeking. Additionally, Joe always understood that Bernie had the vision to deliver him to a higher plateau (as he did lifting him effortlessly out of the 101’ers). Being the next oldest within the early Clash camp, Bernie also may have become the big brother Joe had lost and Joe probably felt he could defer some of the inherent pressure from the press and critics onto Bernie. I think Joe also hated being the ‘bad guy’ and Bernie was the ultimate vote splitter between Joe and Mick. 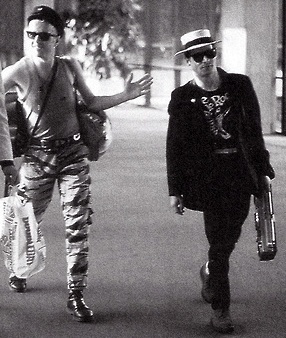 Bernard Rhodes and Joe Strummer – La Guardia airport Oct, 1982. Read into that what you will – whatever the true dynamics of the relationship, Joe’s zealous belief in Bernie’s flawless capriciousness was the result of unreasonable logic, and one which wouldn’t accept new data and new facts. Again, it all comes back to Joe’s filial relationship with Bernie and his fervent belief in Bernie’s judgment. It’s easy to see how Joe would have regarded Bernie as a harmless eccentric outlaw, willing to do battle with authority and ‘rob the bank’ while hurting no one. Bernard Rhodes at the RCA. When viewing that time, a fundamental mistake (even today), is the belief that Joe insisted on Bernie’s reinstatement in order to rekindle the spirit of 1976 and reassemble the old team. It’s true that Alex Michon was brought back on board to add her creativity and inspiration to the Clash clothing and she was set-up in an office in New York. CamdenTown also became part of our sphere of operations again in 1981. However, lurking underneath the initial frisson, there was a much larger agenda that wasn’t so apparent. On a fundamental level, Bernie was brought back by Joe to change things – not to do the same! Once reinstated, Bernie then set about reconstructing the band he had originally created and resurrected the Stalinist regime he had fostered back at Rehearsals in 1976 (unfortunately with disastrous consequences for the band). 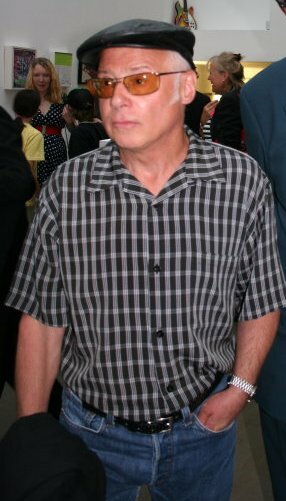 In retrospect, I realize that Bernie was always in the background making odd covert appearances even though he had been officially fired, and was kept there by an ever-enthusiastic Joe. It makes me wonder if Bernie ever really fully went away. Note: Everything presented here is my own subjective viewpoint taking into consideration what I saw and heard during my seven years working for the Clash. Inevitably, others will have entirely different points of view, but I welcome all ideas and discussion on this most fascinating and misunderstood man. This entry was posted in Uncategorized and tagged Barry Auguste (The Baker), Bernard Rhodes, Dave Goodall, Joe Strummer, The Baker, The Clash videos on July 31, 2013 by thebaker77. Lovely insight again Baker, for which I’m grateful, although I noticed that you’ve left Kosmo vinyl out of the pic of Joe and Bernie at La guardia airport. I don’t know if you’ve read Kris Needs book on Joe? He’s very mistrusting of Kosmo, As is Robin Banks who felt the same and apparently Johhny Green as well. You were with the band longer than all of the above, Were you of the same opinion ? Sorry if it sounds personal, and you don’t have to answer it, it just seems he was a thorn in the side ( or just generally a pratt ) of a few Clash crew. Thanks for the question Hassan. No, I have not read Kris Needs’ book. 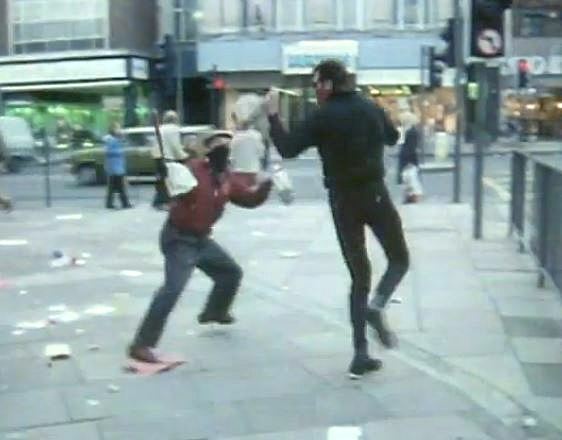 Kosmo was never a prat (far from it,) – I think initially Kosmo was an opportunist with an eye on the main chance (lets face it, even I had taken a chance on punk rock back in 1976 when I gave up a printing apprenticeship to work with both Subway Sect and The Clash.) But when Kosmo found it was a war worth fighting for and came fully onboard, he was 100% with the band. That’s not to excuse the misguided direction that he and Bernie led the band in. But in all fairness, You can’t have it both ways, that was the brief he was given – “make us into a household name in America.” – nice guys finish second. Having said that I think he would have done a fine job no matter who he worked for. You have to remember, he was a fairly late-comer, not appearing until mid-1979 (despite quotes made to the contrary earlier this year). Those of us on the crew viewed him originally with deep suspicion. Under the guise of a streetwise comrade-in-arms, he endeared himself to anyone that would entertain his ‘barrow-boy carney’ talk. He had the gift of the gab, I’ll give him that. Mick, was first to fall under the spell of the ‘crafty cockney,’ and Kosmo quickly became Mick’s man more than anyone’s. But once Kosmo made it clear where his ultimate loyalties lay, Bernie found someone he could team up with and use to his advantage. The worst of their covert plots (and the one that really crossed the line), was Joe’s faux disappearing act in 1982. Bernard Rhodes has all too often been painted as a one-dimensional pantomime villain of punk. To those of us who worked with the man, the reality is much more nuanced and complex. In my daddy was.. The Baker, being one who was actually there, goes some way in redressing the dumb historical imbalance in this intelligent, thoughtful and psychologically pertinent piece. Indeed Alex, Bernie is not in this world to make friends, it seems his mission is to effect change. He’s the instigator and catalyst for transformation and if you don’t get that, you will become insulted and offended by him. He learnt from Malcolm that to get someone’s attention you have to shock them first, as I was personally was on many occasions – but every one of them made me examine my perspective and question my viewpoint. Some even opened my eyes…. Nice blog Baker. Great you’re telling your story at last. 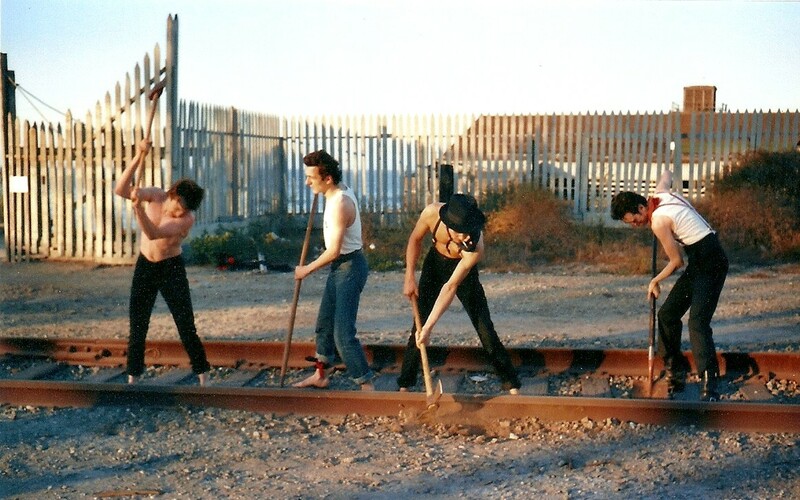 It’s always seemed to me that the Clash broke up because they were just burned out. In 5 years they did the equivalent of nine albums or so and innumerable tours. (I saw them In Australia in 82). That kind of workload can’t have been sustainable surely. You said that Joe had to shoulder the criticism for ‘Sandinista!’ I’m a writer and I think that what Joe demonstrates with the lyrics of ‘Sandinista!’ is that he was a great contemporary poet. I think of him as a poet first and a rhythm guitarist second. And I’d be surprised if he didn’t think of himself as a poet as well. Either way, as literature his work is probably greatly underestimated. For my money, ‘Sandinista!’ is something of a masterpiece. Maybe it has some strange flaws. But then all the great masterpieces do. Great stuff. I remember going to the gig that night and saw Don outside Lewisham Odeon with a satisfied grin on his face. I can see why. … reminded me that I never commented on your ‘Bankrobber’ article that I had asked you about. Then today I saw your reply there. 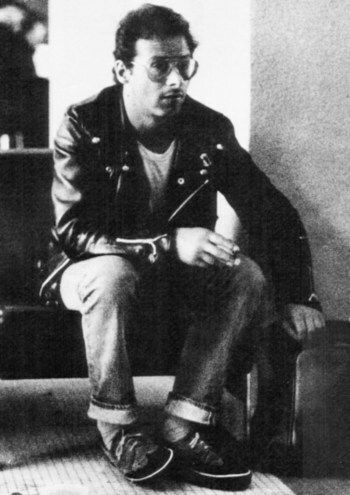 I had noticed Joe Strummer’s “father figure” comment about Bernie in that interview too. Not having been around the band myself and thus only having read & listened to comments by those who were, the idea of Joe seeing Bernie as a bit of a father figure makes some sense to me in terms of explaining Bernie’s return and Joe’s comments on his return in later interviews. Hi Andy, thanks for your thoughts. Once you accept the premise of father-and-child when viewing Joe and Bernie’s troubled relationship, the answers become infinitely more comprehensible. In retrospect, I realize that Bernie was always in the background, even though he had been officially fired, and was kept there by an ever-enthusiastic Joe. It makes me wonder if Bernie ever really fully went away. 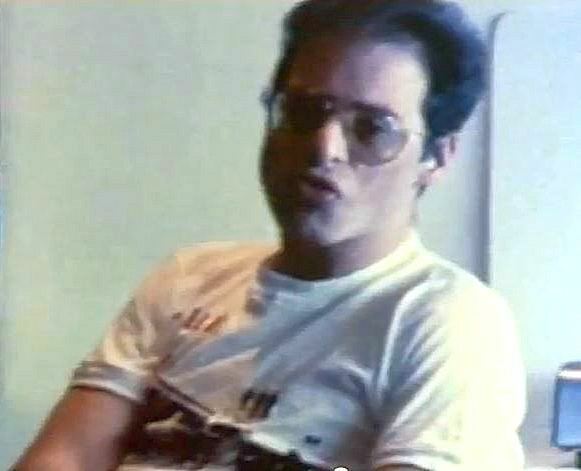 I should not have been shocked by Bernie’s reinstatement as manager in 1981 because as early as 1979 during the Vanilla rehearsals, Bernie showed up for an open meeting with the band. I remember the day quite clearly as we made him play football with us across the road (as we did with everyone that visited us at Vanilla.) The sight of little Bernie running for the ball was hilarious enough on it’s own, but then as he went to kick the ball his over-sized brothel creeper went flying up 20-feet into the air and we all just crumpled to the ground in fits of laughter. Earlier that year Joe had even asked me to drop him off at Bernie’s flat in Camden Road and conspiratorially told me to ‘keep it to myself.’ Roger Armstrong from Chiswick records also reports seeing Bernie’s green Renault 16 with the now-famous CLA5H number plate, sitting in the car park outside Wessex Studios during the London Calling recording sessions. I don’t remember him ever being there, but maybe he had agreed to meet Joe there without the others being present. Andrew King also claims to have had a ‘Bernie-encounter’ in Sweden in 1980. He said he walked into Joe’s hotel room to find Bernie perched on the bed, giving the singer one of his lectures on Marxism. Even though he was ‘officially’ sacked in September, 1978, he never completely went away. The two years of financial legal wrangling that followed was just the egotistical posturing that was entirely consistent within a father/child relationship. I don’t think there was ever any intent to destroy the band during those two years; he just wanted to punish them as an angry father would any headstrong child.